Most moms are pretty great, so great in fact that in the early 20th century a woman called Anna Jarvis campaigned tirelessly to recognise them on a national scale- a decision Jarvis would later come to regret culminating in her more or less dedicating her life and life’s savings to destroy the Frankenstein’s monster of a holiday the greeting card industry molded her creation into. 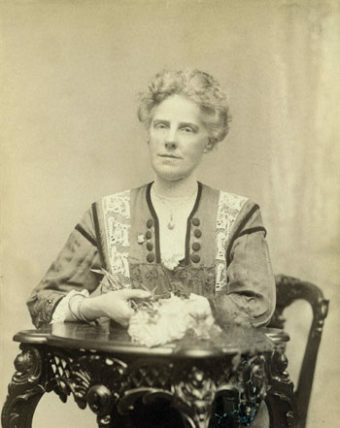 First celebrated on May 10, 1908, the first official Mother’s Day was a somewhat sombre affair marked by a touching speech given by the aforementioned Anna Jarvis in memory of her late mother, social activist Ann Maria Reeves Jarvis, who’d passed away some 3 years earlier. The approximately 70 minute speech, which was delivered in the auditorium of the Wanamaker’s department store in Philadelphia to a reported crowd of about 5,000 people, was by all accounts profoundly moving and resonated deeply with the audience in attendance. Around the same time, Jarvis paid to have 500 white carnations sent to the Andrews Methodist Episcopal Church in Grafton, West Virginia, where she once taught Sunday School, with attendees encouraged to wear these as a small token of their gratitude for all their own mothers had done for them. While this was by no means the first attempt Jarvis had made to celebrate mothers as a concept, it was the first that had a big ol’ stack of cash behind it, with noted Philadelphia businessman and former U.S. Postmaster General John Wanamaker (who owned the store Jarvis gave the aforementioned speech at) backing Jarvis financially and politically. The thing is, as soon as Mother’s Day became officially recognised as a national holiday, the greeting card and floral industry began circling it like hungry sharks that had smelled the unmistakable whiff of a seal basting itself in BBQ sauce. The white carnation is the emblem of Mother’s Day because it typifies the beauty, truth and fidelity of mother-love. This emblem is used on the Mother’s Day association printed matter and official buttons. But it does not mean that people should wear a white carnation. This false idea has led to florists flagrantly boosting the price of white carnations for the Mother’s Day trade. The red carnation has no connection with Mother’s Day. Yet florists have spread the idea that it should be worn for mother who has passed away. This has boosted the sale of red carnations. Confectioners put a white ribbon on a box of candy and advance the price just because it’s Mother’s Day. There is no connection between candy and this day. It is pure commercialization. Thus, offended by the amorphous blob of empty saccharine sentiments her creation had been morphed into, Jarvis spent the rest of her life trying to destroy Mother’s Day, among other things filing countless lawsuits against various entities related to the holiday, including one against a non-profit Mother’s Day organization headed up by none other than First Lady Eleanor Roosevelt. Although, it should be noted that while Jarvis hated the commercialization of Mother’s Day, in fact, it is very possible that had it not been commercialized it would have been largely relegated to a minor holiday, or disappeared altogether, as has happened to numerous other such holidays over the centuries. As you look at the history of holidays, the ones that survive and become extremely popular are nearly always the ones that get commercialized in some way. If there’s money to be made on a certain holiday, businesses will literally advertise the holiday, making sure that it is as popular as it can be and that it sticks around. Eventually her health declined to the point where she herself went blind and she needed outside care, at which point she was put into the Marshall Square Sanitarium in Pennsylvania. As she didn’t have any money to pay for the care she was receiving there, ironically, the bill was reportedly largely paid for by a group of businessmen in the floral industry that so benefited from her great idea. Naturally so as to avoid upsetting the elderly Jarvis, it appears she was never told of their part in paying for her care. Sad story…Happy Mother’s Day To all mothers anyway.